The right-back, who scored in Saturday’s 4-1 win over Maidstone United, credits the ‘winning mentality’ instilled in the squad by Sheridan. Under the Mancunian, Town have won 10 of their 17 games. “He demands from every single one of us every day,” said Barry. “Training is always high quality. “He brings the young lads up, shows us fresh faces so we’ve always got competition. “And that winning mentality has drive us to where we are. “After getting relegated last year, it’s stopped that. 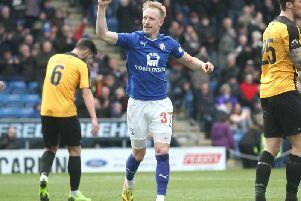 There are three games remaining in the National League season and although Chesterfield are safe, a full 17 points clear of the drop zone, Barry says there will be no easing up at the Proact. “We want a winning mentality, especially being at home,”he said.